So how much is the most expensive apartment in NYC? Answer: A cool US$130 million! The accolade belongs to a triplex penthouse at Zeckendorf Development Co's tower under construction on Manhattan's Upper East Side. The 12,394sqft property will span the top three floors at 520 Park Avenue, where sales will begin in the first quarter of next year. The building, between 60th and 61st streets, will include seven duplexes of about 9,138sqft each, starting at US$67 million. Single-floor units of about 4,600sqft will start at US$16.2 million. The triplex would be the most expensive listing for an apartment in New York history and the largest on the Upper East Side. The unit will include a 1,257sqft terrace with views of Central Park to the north. 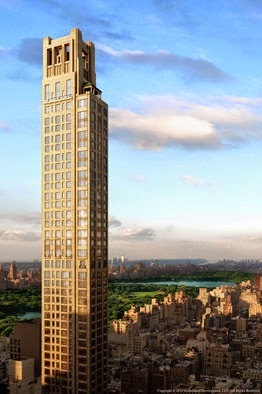 520 Park Avenue is slated for completion in 2017. The asking price works out to about US$10,000psf, which is the average resale price of condos that face the park at the Zeckendorf's 15 Central Park West. At that complex, on the Upper west Side, former Citicorp Inc chairman Sanford Weill sold his penthouse for US$88 million in 2012, Manhattan's most expensive completed residential deal. No Comment to " So how much is the most expensive apartment in NYC? "